Summary: It is 1870 and Captain Jefferson Kyle Kidd travels through northern Texas, giving live readings to paying audiences hungry for news of the world. An elderly widower who has lived through three wars and fought in two of them, the captain enjoys his rootless, solitary existence. In Wichita Falls, he is offered a $50 gold piece to deliver a young orphan to her relatives in San Antonio. Four years earlier, a band of Kiowa raiders killed Johanna’s parents and sister; sparing the little girl, they raised her as one of their own. Recently rescued by the U.S. army, the ten-year-old has once again been torn away from the only home she knows. Their 400-mile journey south through unsettled territory and unforgiving terrain proves difficult and at times dangerous. Johanna has forgotten the English language, tries to escape at every opportunity, throws away her shoes, and refuses to act “civilized.” Yet as the miles pass, the two lonely survivors tentatively begin to trust each other, forging a bond that marks the difference between life and death in this treacherous land. 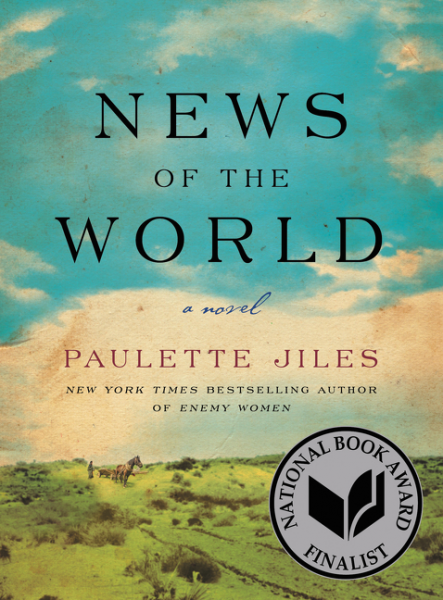 I am extremely late in writing this review for NEWS OF THE WORLD by Paulette Jiles. My book club read this book over the summer, and even though I've had this book for months, I didn't get around to reading it until a few days before our meeting. Boy, was I missing out. I probably don't need to tell you this because NEWS OF THE WORLD was a finalist for the National Book Award, but this book is fantastic -- one that is not to be missed. NEWS OF THE WORLD tells the story of Captain Jefferson Kyle Kidd, an older man who travels through Texas reading the news to paying audiences. He is a widow and has fought in two wars, yet he is fairly content with his travels and job. However one day, he is offered $50 to deliver a young girl to her relatives in San Antonio, and his life is drastically changed. The young girl named Johanna was kidnapped four years ago by the Kiowa Indians in a raid where they killed her parents and sisters, and she's been living with them ever since. She has recently been traded for by the U.S. Army, but she has no memories of any family but her Kiowa one. Needless to say, this poor girl speaks no English, is a terrified and a bit wild. Captain Kidd and Johanna make a dangerous 400 mile journey together which is difficult and frustrating for both of them; however, throughout the course of their travels, they learn to trust each other and even depend on each other for their survival. However, when they arrive in San Antonio, the reunion with Johanna's family doesn't go quite as expected. Her aunt and uncle, whom she doesn't even remember, are bitter and resentful about having another mouth to feed. Captain Kidd is forced to make a horrible decision -- to leave Johanna with her family or take her and become a criminal in his own right. I loved NEWS OF THE WORLD and my book club members agreed. This novel is beautiful -- from the gorgeous prose, to the complex characters, to the touching story. It's a relatively short novel, coming in at a little over 200 pages, and it's truly amazing what Ms. Jiles accomplished in so few pages. Each word is meaningful and, basically, perfect... and I honestly can't recommend this novel enough. There really is so many positive things to say about this novel, but I'll focus on just a few of my highlights. One of my absolute favorite things about this novel was Captain Kidd. He's an extremely interesting character because of his life experiences, but also because of how he handles Johanna. Captain Kidd is a pretty old man for the 1870s, and he had no idea what he was getting into when he said he'd return Johanna to his family; however, he was also a principled man who was determined to do his best for the girl. I absolutely adored him! Another wonderful thing about this book was the relationship that developed between Captain Kidd and Johanna. The way these two managed to grow closer as they traveled together was extremely heart-warming. At first, they realized that their relationship was mutually beneficial for survival, but then they actually became quite fond of each other. I also loved Ms. Jile's writing. Not only did she create an interesting story with complex characters, but she wrote with such beautiful prose. I've read books by this author before, and I've always had major respect for her, but she outdid herself with this novel. There is no doubt that this book was worth of being a National Book Award Finalist! And finally, I loved how NEWS OF THE WORLD explored some interesting ethical issues. There is a great deal to think about (and discuss) in this novel, but none more special than delving into Captain Kidd's dilemma when he returned Johanna to her relatives. Some other interesting themes from this novel include the history of Native Americans in our country, parent/child relationships, and trust. There is also a reading guide available with eleven thought-provoking questions if your book club members like to use a formal guide. In summary, NEWS OF THE WORLD is a beautiful novel that I highly recommend for fans of historical and literary fiction. Thanks to the publisher for providing a copy of this novel. You've convinced me I need to pick this up soon. I wonder if I could convince my book club to read it. Sounds like an amazing book.I may have to add it to my list. I'm seeing this book everywhere. It's becoming very tough to ignore/dismiss. New one for me. Thank you so much for review. Going on my TBR. Kid Konnection: Hockey Then to Wow!